Is this scene familiar to you? You’re out with your family on a spring or summer day. It’s warm, sunny and pleasant. Everyone’s having fun until you hear the buzzing. From one side and then another, buzzing yellow streaks dart by so quickly that you can barely see them. Whatever you were doing before, it’s time to leave. The yellow jackets are out today. It’s one thing to have a day out ruined by these pests, and quite another to have them in your home. Keep reading to discover some behaviors that are common to local yellow jackets, and how you can use pest control to avoid them. Yellow jackets resemble honey bees in overall shape, but their visual details are quite different. While bees look soft on the outside, yellow jackets appear harder. Instead of the bees’ brown and orange bands, yellow jackets have contrasting yellow and black stripes. With an average size that ranges from just under to well above half an inch, they’re bigger than most, but not all types of honey bee. Honey: Yellow jackets don’t produce it. They’re not useful to humans at all. Aggression: While honey bees generally don’t sting without a reason, yellow jackets don’t care. They’ll sting you just for being in what they consider to be their territory. The sting: Everyone knows that a bee can only sting you once, and that it kills them afterward. Yellow jackets can stin over and over, and their venom is more painful than a bee’s. You might not believe that yellow jackets don’t grow over about 5/8 of an inch. It’s not uncommon to see yellow jackets that are nearly twice that length, and a lot more massive. These enormous insects make a loud buzzing that sounds like a small flying drone. They’re so big that you can see their jaw mandibles moving and make out the fuzzy paches of hair on their backs. While huge and terrifying, there’s good news. These are not actually yellow jackets. They’re European hornets, a completely different species. These filers are far less aggressive than yellow jackets. Their stings do hurt, but they very seldom attack without provocation. That said, it’s good to get rid of their hives because European hornets like to kill honeybees. What precautions can you take to keep your family safe from yellow jackets? When you run across yellow jackets, don’t panic. If you swat at them you’re only likely to provoke an attack. The best thing to do is to pack up and move if you can. To keep them from becoming a problem in the first place you can set out yellow jacket traps. These traps really work. You’ll notice this when you toss one that’s filled with dozens of bugs. If you set them up, try placing them far enough from your home as possible. This draws them away from the building. 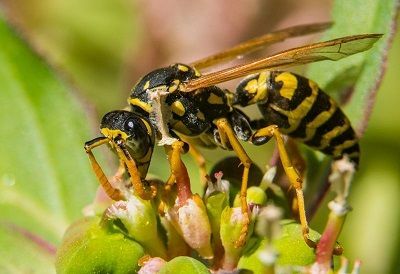 What attracts the yellow jacket wasp? If you know what yellow jackets like, you can limit how strongly you attract them. These pests enjoy getting into garbage. Get a garbage can that’s large enough so you can keep it closed at all times without bags hanging out. Yellow jackets also love sugary sweets. If you throw out or recycle pop cans and bottles, make sure to rinse them out in the kitchen sink before taking them out. Their taste for meat means that your summer barbecue is a big target. If you hold gatherings with lots of food and sweets, try to do it in an area with wide open spaces and fewer trees, since yellow jackets like to live in wooded areas. If you happen to find a nest on your property, it’s not something that you want to try and take care of on your own. If you do it wrong you’ll only end up stung by the yellow jackets. This calls for a licensed exterminator. 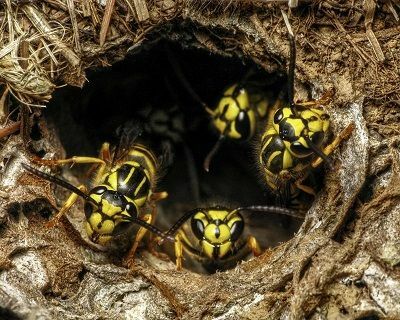 Another very serious scenario is having yellow jackets build a nest inside your home. there are a few tell-tale signs that can tip you off. If you hear regular buzzing, such as loud, low drone, that’s probably the hive flapping their wings to regulate the temperature inside. You might also hear a clicking or snapping sound coming from the walls. It might seem like termites, but it could also be yellow jackets biting into the frame. An experienced exterminator knows how to find the location of a nest, and how to safely dispose of it. The stakes when it comes to dealing with yellow jackets are very high. Unlike spiders they tend to come out in large groups. They buzz, they bite and they sting without relenting. The danger increases for anyone who’s allergic to the stings. You might be allergic without knowing it. We can’t say this enough. When you have a yellow jacket problem, seek out an exterminator. When it’s time to call the cavalry, your best bet is The Killers. 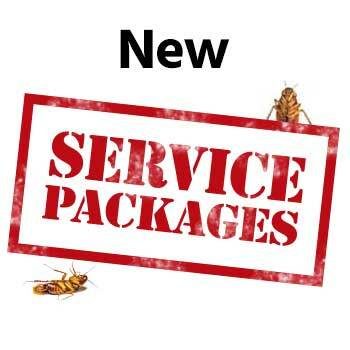 We’ve been in the area for decades and have experience taking care of every sort of pest. Whether it’s yellow jackets, wasp, or even large rodents, we can get rid of them all. All you have to do is fill out the contact form on this page or give us a phone call. Consultations are free. We come out and inspect your property before getting started. All of our technicians are properly licensed trained to take care of the problem completely. Once we’re done we can show you how the yellow jackets likely got onto your property and give you tips and solutions for preventing them from coming back. 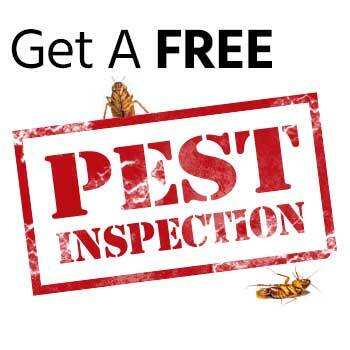 For your convenience you can set up a program where we come out to perform regular inspections and take preventive measures to keep the pests from coming back. The safety of you and your family is too important to leave it in the hands of just anyone. Trust The Killers to keep you safer from yellow jackets starting today.